I was told the other day that this year the Milton Keynes College celebrates its 30th year. It was formed in 982 out of a merger of Wolverton and Bletchley Colleges of Further Education. This history of organised adult education is, in truth, much, much older and this year we are looking at 172 years of adult education in Wolverton. From the very earliest days of Wolverton station the newcomers were looking for opportunities for self improvement. Hugh Stowell Brown, who arrived in Wolverton as a 16 year old in 1840, describes how he and his mates, lodging in a peasant cottage in Old Wolverton, would spend their spare time studying – and they were working 58 1/2 hour weeks! One of his room mates, Edward Hayes, went on to found the Hayes Engineering works at Stony Stratford. 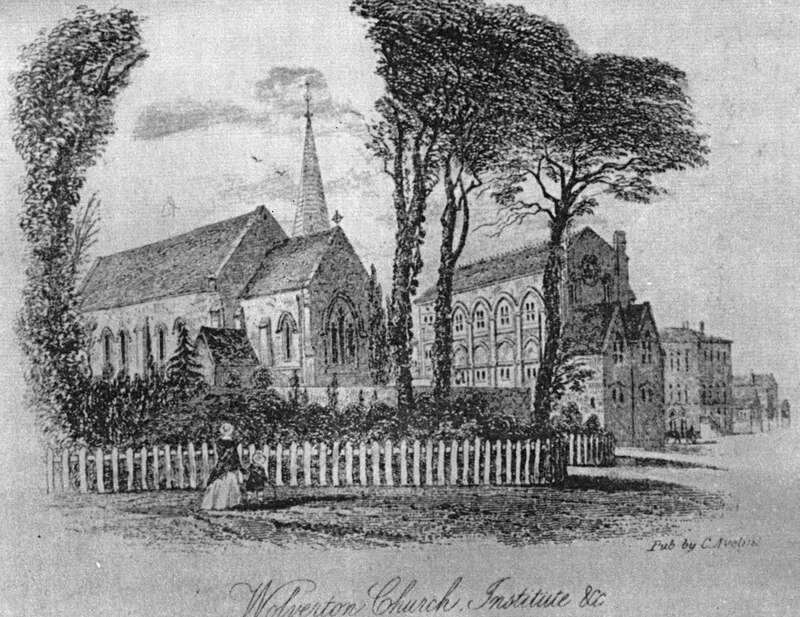 The new arrivals in Wolverton were skilled workers and mostly literate, and having that basis in education wished to learn more. Accordingly, a group got together and founded a Mechanics’ Institute – The London and Birmingham Railway Institute for Moral and Intellectual Improvement at the Wolverton Station. (Our Victorian forebears had no interest in short, snappy titles and acronyms.) The date was June 1840, barely one year after the opening of the works and it was probably the second foundation of its kind in the entire country – the first being Owens College in Manchester, for a long time now the University of Manchester. The LBR also built a Reading Room near the canal and William Pousett, a senior clerk, was given £25 to establish a library. Later, individual benefactors gave money which expanded the library to 700 volumes. This put the two critical components in place, the organisation and a resource library of books. Men who were knowledgeable in one field volunteered their time to teach their fellows. The evening class was invented. It was also resolve to raise funds for a building for the Mechanics’ Institute and men contributed what they could out of their savings. For some reason, progress stalled. McConnell hinted in his speech on the occasion of the Christmas Soiree that there were divisions within the committee, although he did not say what the cause might be. He did express the wish that on this occasion they might go forward with more brotherly unity. Possibly there were differences abut how the money should be spent or how much the railway company should contribute. At any rate, the project was slow to move forward. Eventually that day did come with a substantial commitment of funds from the LNWR and a new building opened its doors in 1864 on the corner of Church Street and Creed Street – now a car park. This is the earliest drawing, probably done soon after it opened in 1864. It was called The Wolverton Science and Art Institute. In this guise it continued to offer evening classes and to function as a library. Demand continued to rise in the last quarter of the 19th century and in 1890, a grant of £300 from the recently-formed Buckinghamshire County Council, enabled the institute to be enlarged. This is how it appeared in the early 20th century. 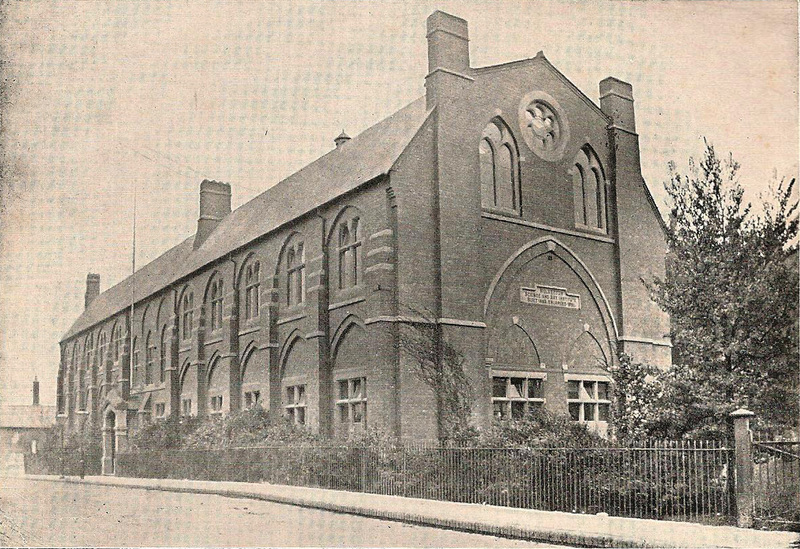 In 1908 the Wolverton County School began its life here before the new building opened at the top of Moon Street in 1909. In that year the Science and Art Institute got its first paid Principal – a part time employee. The evening institute was increasingly successful and many young men and women were educated there. The school leaving age in those days was 13 and most young people left school for work with only a rudimentary education. In 1925 there were further developments. The Institute gained a full-time Principal and some staff. Part-time day classes were offered and full-time technical education was on offer for 13 year olds. In other words, young people could now continue their education beyond school without going to the County School. Change and improvement continued over the years. After the 1944 Education Act the day school was free of tuition fees and admission was by examination at 13. Pupils normally continued to 16 and took subjects in the new General Certificate of Education. Formal qualifications through part-time study were ow available through the Royal society of Arts and through Ordinary National Certificate and Higher National Certificate. The term “Further education” entered the lexicon and in 1954 the Wolverton Science and Art Institute was re-named Wolverton College of Further Education. In 1956 Bletchley Grammar School opened and all the pupils who had regularly travelled to Wolverton Grammar School attended their own local school. Bletchley residents continued to make the daily train journey to Wolverton. The days of the”Tech” were now numbered. 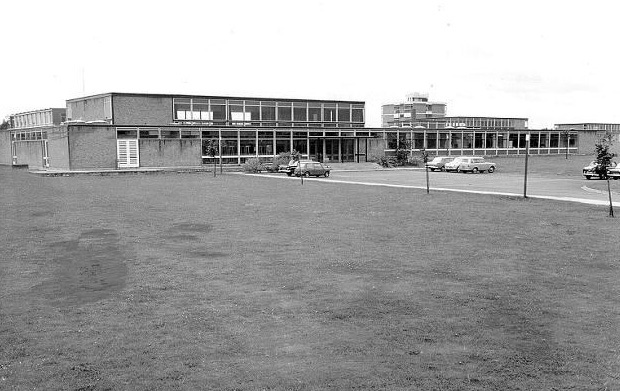 The educational authorities started negotiations to bring the Wolverton Grammar School and the Tech together in a single institution, and in 1958 this was formalised as a single school – The Radcliffe School. The Wolverton College of Further Education now concentrated on day-release classes and evening classes with a strong vocational focus, returning in some respects to its 19th century roots. The new college opened on a field site on the Stratford Road, (Innocently, as archaeologists later discovered, destroying the remains of a bronze age settlement on the site.) These buildings were in use for about 30 years and then demolished to make way for a housing development. Milton Keynes College now has campuses in the centre and south west. In the meantime the old Science and Art Institute slipped into partial use, to occasional use and then disuse. 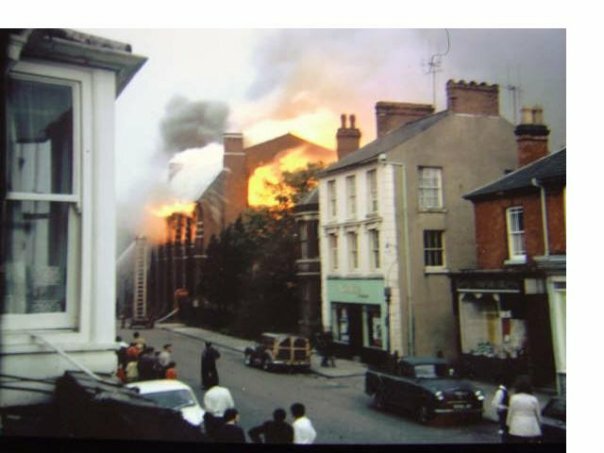 In its state of disuse it became vulnerable and one night in 1970 someone started a fire, which quickly engulfed the building. This is what it looked like the following day. The Council quickly demolished the building without trying to reclaim it. Further education continues to be important and people of all ages are now offered a large array of training and retraining choices, only they are no longer in Wolverton. So it is with some sadness that we note that Wolverton, once a 19th century pioneer in the held of adult education, no longer has any presence or any physical reminders of its contributions to vocational education.